Newcastle manager Steve McClaren should be sacked as the club embark on a "rescue operation", according to former Magpies owner Sir John Hall. 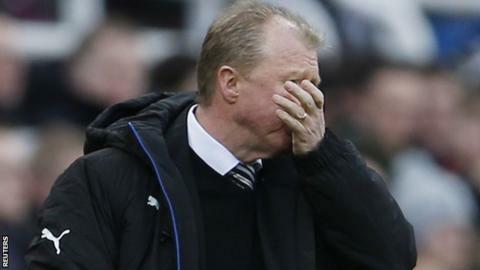 Saturday's 3-1 home defeat by Bournemouth left McClaren's side above only Aston Villa in the Premier League. It was a third successive loss for the Magpies, and Hall told BBC Radio 5 live's Sportsweek: "You need change. "Steve is not getting them to play and it's probably time he goes. You've got to find someone to harness the team." Former England coach McClaren, 54, was appointed as John Carver's successor in June last year but has presided over only six league victories this season. The defeat by Bournemouth was Newcastle's eighth loss in the past 11 matches, and their tally of 24 points is their lowest at this stage of a Premier League season. McClaren described Saturday's performance as "going down material" and admitted his side are in a "four-team league" at the bottom with Sunderland, Norwich and Aston Villa. Legendary former Newcastle striker Alan Shearer said on Match of the Day the club is in "a mess from top to bottom". Hall, 82, sold his stake in the club to Mike Ashley in 2007. He said: "I'm like every fan - utterly depressed. If I was Mike Ashley, I would be tearing my hair out. "Something is not right there. Mike Ashley has put money in and they are not gelling. "It's got to come down to management. I would have someone in mind to bring in. At this moment we are prime candidates for relegation." Former Everton and Manchester United boss David Moyes, who was sacked by Real Sociedad in November, has been linked with the job. "I'm out of touch with the managers but you need someone who can motivate the players and change the tactics," said Hall. "Moyes is a nice fella. Whether he has got the strength of character, I don't know. But I say again to the fans - you've got to get behind them, it's no good booing, that won't help. "We should not be in this position and we should be asking why."